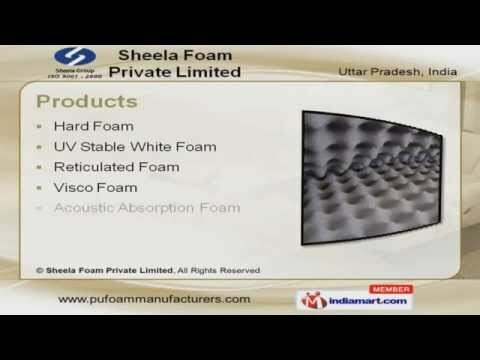 Welcome to Sheela Foam Private Limited Manufacturer & Exporter of PU Foam Products. We are an ISO 9001:2008 certified company, established in the year 1972. Our high quality products & wide distribution network has helped us to earn highly esteemed clients. Timely delivery, industry leading prices, spacious storage facility & stringent quality tests are some of the key features of our organization. We are engaged in offering Hard, UV Stable White, Reticulated, Visco & Acoustic Absorption Foams. Our Mid & Bottom Shoe Sole Foams are widely acclaimed in the market. We offer premium grade UV Stable White Foams at market leading prices. Reticulated Foams are some of our best selling products. Along with that we provide wide array of Visco Foams that are manufactured using high quality raw materials. Our High Resilience Foams are a class apart.